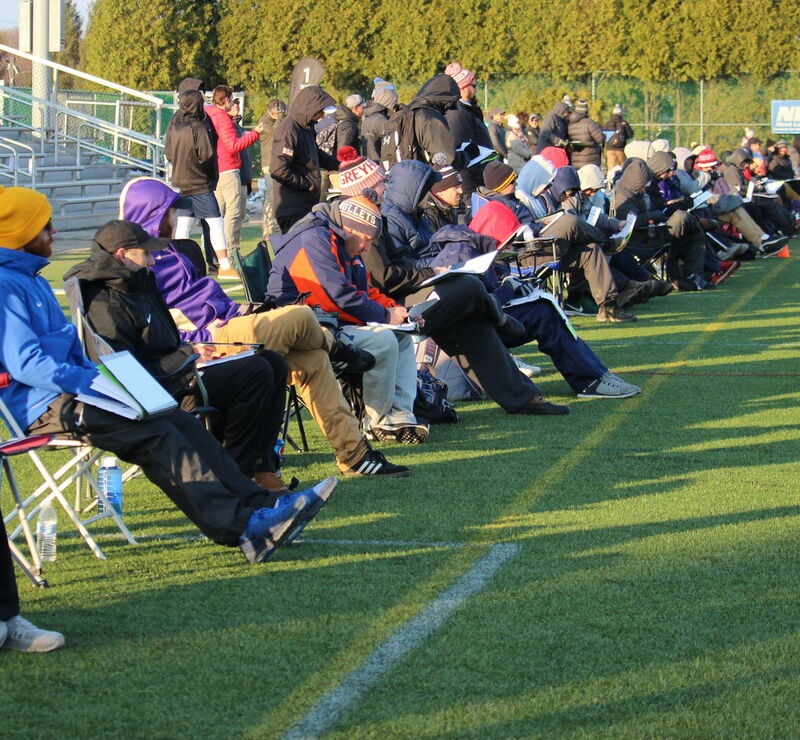 186 College coaches from 144 colleges attended the Boys Philly Showcase and Invitational in Downingtown, PA this past weekend to coach and watch almost 700 players compete for a chance to be on the All-Star team on Saturday. 84 teams compete on Sunday. The 2018 Boys Philly Showcase celebrated its 10th Anniversary this past weekend at United Sports in Downingtown, PA. Snowy weather didn't stop Showcase X from happening or having an abundance of college coaches attend to watch players compete during this intense one-day tournament. 680 players traveled from across 27 states and Canada to participate in the Showcase and Invitational. This highly competitive event attracted 186 college coaches from 144 different schools. 53 Division I, 14 Division II, and 70 Division III schools populated the sidelines to watch 2020, 2021, and 2022 recruiting classes. 31 colleges brought multiple staff members including Denver, University of Massachusetts, Penn State, Villanova, Delaware, University of Pennsylvania, Dartmouth, and more. The reigning 2018 NCAA Divison I Lacrosse Champions, Yale University was also onsite recruiting their future Bulldogs. Bill Tierney, Head coach of the University of Denver and seven-time NCAA Division I Lacrosse National Champion Head Coach, was present at United Sports for both the Showcase and Invitational. At one point throughout the day, over 70 coaches lined Field 1 in the afternoon giving players maximum exposure to the recruiters while competing against some of the top high school talent in the country. All players were evaluated during every game by an unbiased evaluator and the top 120 were chosen for the All-Star Fab 40 teams. For the 10-Year Anniversary, the All-Stars were decked out in Nike and Epoch - the most ever given out at the Showcase. Nike gave the players a hoodie, hat, t-shirt, and gear bag. And new to 2018, Epoch Lacrosse joined NXT Fall Showcases as its Presenting Sponsor! They provided the All-Stars with a sideline bag, custom Integra gloves, and Dragonfly shaft with a strung Z One head. Epoch released its brand new Z One head exclusively to all Showcase players before it hits the market this November 23rd! On Sunday, the Boys Philly Invitational had over 1,200 players from 84 teams compete piquing the interest of the college coaches who were in attendance for the Invitational! Despite the snowstorm earlier in the week, the Invitational moved to four sites to ensure all games were played. Across 11 fields, all teams played on turf, giving them the best experience with top-level facilities so they can compete at the highest level in front of college coaches. Throughout the Showcase and Invitational weekend at United Sports, the 2020 division had at minimum 20 or more college coaches watching each game. With only four turf fields, the players had more exposure to college coaches than ever before. Follow Showcase Lacrosse on Twitter and Instagram. Click here to view pictures from the Boys Philly Showcase and Invitational!